This course is often paired with catechism training in order to earn a certificate for Confession Preparation. To those who meet the requirements as outlined in the "Course Calculator" on our website, this lesson can earn a Certificate in First Confession Preparation. By preparing for your First Confession you take an extremely important step forward in your spiritual life. 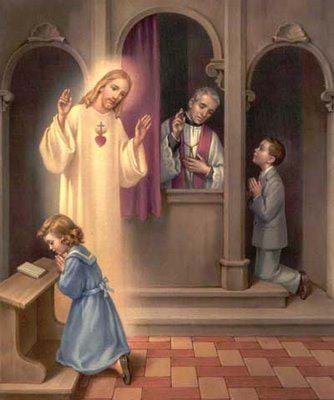 God has instituted the Sacrament of Confession as the means to receive forgiveness of your sins. So many people seek the help of counselors or psychologists but are still empty. The answer is that only in the Sacrament of Confession can we truly receive forgiveness for our sins. Our souls are restored to God's friendship, the Trinity again dwells in us, we can again merit for our good works, and we do not risk falling into everlasting hell. Confession is an immense gift. As a Catholic, you should go to Confession at least one or twice a month - more often if you struggle with certain sins. God is always ready to forgive if you are ready to change your life.